Now that we're on baby #2, there are some things from the first time around that I continue to use this time, along with a couple of new things this time around. 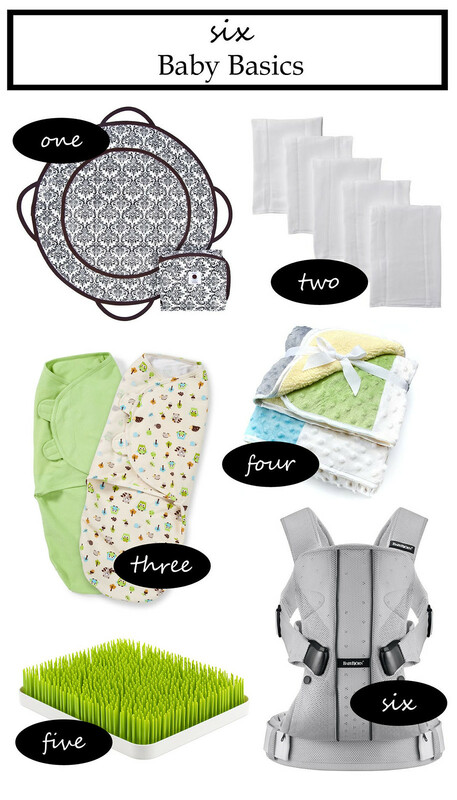 This isn't an exhaustive list of all the baby items we use, but many of the ones that I've found most useful. When we had Evie, a friend gifted us a Patemm changing pad (specifically, the Manhattan Momma Black & White pictured above). At the time, before I started to use it, my thought was that it was just another changing pad (and a bit of a pricey one at that), of which we had several. After I started to use it though, I shelved every other changing pad in favor of this one, particularly for diaper changes while we are out. The laminated cotton makes it easy to wipe clean and most importantly, since it's nice and big, it keeps messy diapers with flailing/rolling babies contained well. (I've changed many diapers in the car, where I'm most afraid of the mess escaping). The customer service of the company is good too - the binding on the original one started to unravel and I contacted the company to ask if it was something that could be fixed. I sent it back to them and then ended up just sending me a new one. I've found cloth diapers with absorbent padding down the center to be my preferred burp cloths (I don't actually use these for diapers). I like the ones with the added absorbent padding given how much babies can sometimes spit up. We have a few plain ones that we use in a pinch, but for the most part, I use these burp clothes that I sewed before Evie came. The extra fabric on the cloth diaper makes it just a bit thicker, which is a good thing. When we first had Evie, I tried swaddling her with receiving blankets and that didn't work very well because she wiggled out of it like nothing. I felt like it also took more effort to get her swaddled with just a blanket. We got these swaddlers and they worked better for actually keeping her swaddled (though the older they get, the better they are at wiggling out of everything). It was faster to get her swaddled to begin with, which was especially important to me in the middle of the night when I don't want to wake them up any more than I have to. With Parker, I tried to use a swaddler right off the bat and he didn't like it at first, so I thought that they wouldn't work for him at all. I gave these swaddlers another try at around five weeks, after feeling frustrated at how easily he woke himself up (sans any kind of swaddling), and was happy that they did help him sleep longer after all. We found that babies become attached to whatever blankets or toys you consistently put in their crib after they start to become more aware of their surroundings and things around them. 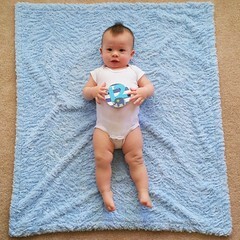 With Evie, we picked up two of these blankets and used these with her almost exclusively, so it became her blankie. Since we had two, we were able to switch them out if needed for washing. We are doing the same with Parker - we picked up two of these blankets, though different colors than Evie's Evie's blanket is fairly gender neutral, whereas with Parker we picked out blue/green/grey ones. This is a popular blanket, because I've also seen a classmate of Evie's with one, and a co-worked of mine was gifted a pink and purple one when she had her daughter. I'd eyed this drying rack before we had Evie, but ultimately decided we didn't need it. Fast forward to a few months ago and a friend just so happened to gift this to us (after using and liking it herself), along with a twig accessory. I was like, yay! I could've gotten by without it like the first time, but it does work better in that things dry out faster on the rack than just a towel on the counter. With Evie, I'd borrowed a Baby Bjorn carrier, but only used it a couple of times with Evie. I'd wanted to borrow it again this time around, but I broke down and just ended up buying our own (more like, Greg did the researching and buying, per the norm - heh). This carrier is different than the one that I used with Evie in that they added the functionality to convert this to a backpack style carrier for a toddler, so its useful life is longer. I've already used it daily with Parker - basically any time where he will get fussy if I put him down, I'll put him in this carrier, which allows me to effectively hold him while still having two hands free. I've also used it walking around at the mall (same thing, lets me have both hands free). I'm glad we got this given how much I've used it already.